What’s the first thing that comes to your mind when you think leftover rice? 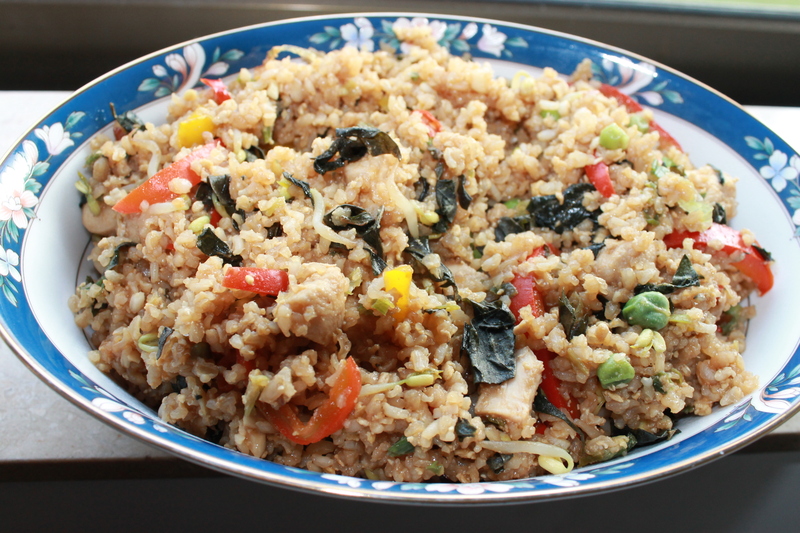 I bet its “fried rice” –the widespread solution for leftover rice. Any disagreements on fried rice being the common answer for leftover rice can be resolved by the 36million plus results on Google for “fried rice”. While rice and vegetables or meat are common to this classic one-pot dish the herbs and spices used vary by region and personal taste. This recipe uses Thai Basil, fish sauce and bird’s eye chilies to create a “Thai” version of a favorite one-pot meal. The “Thai” touch adds a little oomph to a comfort classic, creating a dish that will tantalize your taste-buds and satisfy your soul. 1) In a small bowl mix the oyster sauce, fish sauce and soy sauce and bird’s eye chilies and set aside. 2) In a wok or large frying pan, heat the oil on medium-high heat. Add the green onions and garlic and cook for a minute. 3) Add the red and yellow pepper and cook for 1-2 minutes until the peppers are slightly tender. If using chicken add it now and cook until the chicken is fully cooked through. 4) Add the peas and bean sprouts and cook for another minute. 5) Move all the ingredients to the side and break the egg into the center of the wok. Stir constantly to quickly scramble the egg. 6) Add the oyster, fish and soy sauce mixture and stir well with all the ingredients. 7) Turn the heat to high and add the rice and blend everything well together. Add salt and white pepper per your taste. You can also add more fish sauce or soy sauce at this time. 8) Once the rice is heated through remove from the heat and stir in the basil. Serve hot. It is the time for New Year’s Resolutions; often know as – lofty promises of regular workouts and healthy meals. These resolutions are more than often short-lived pledges that fade away within a few weeks into the year. But since most of us are trying to start our year right, this is a great salad to add to a healthy regimen. Its intense flavors will ensure that even though you’ll soon revert to your old ways you may just crave to eat this salad throughout the year. This salad is inspired by my favorite salad on a recent trip to Thailand. Its star ingredient is the Pomelo, a citrus fruit similar in taste to a pink or Ruby Red grapefruit (great substitutes if you cannot find Pomelos). The fish sauce, Thai basil and birds eye chili add a quintessential Thai flavor to this salad, creating a unique and invigorating salad for any meal of the day. You can use Thai Pomelos, South Indian Pummelos or ruby red grapefruits for this salad. The dressings and all other salad ingredients work well with any of these 3 fruits. Pomelos can be found in Mexican and in Asian markets. Thai Basil can be found in all Asian Grocery stores as well as some of the larger grocery chains. 1) In a small bowl mix together all the dressing ingredients and set aside for 15 minutes. 2) In a large bowl Toss together all the salad ingredients (except for the peanuts and lettuce). 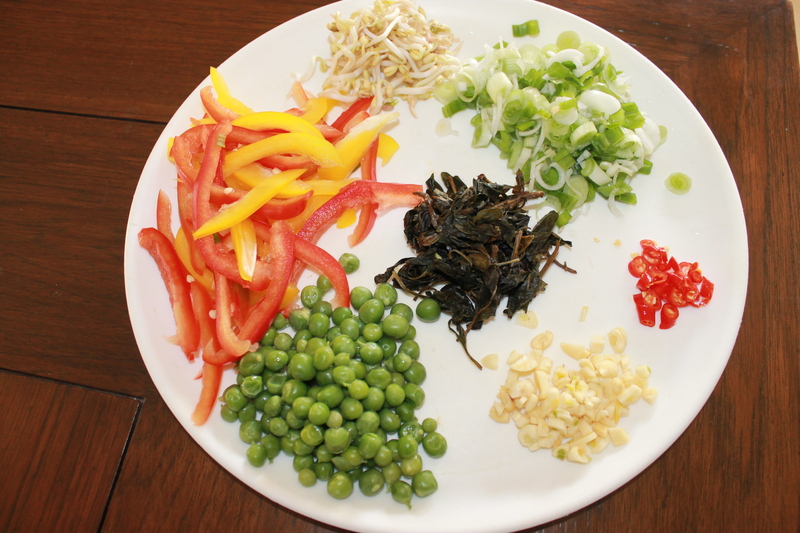 3) If you do not want a very spicy salad, at this stage remove the birds eye chili from the dressing. Pour the dressing over the salad and toss well till all the ingredients are well coated with the dressing. 4) Refrigerate for 30 minutes (can be refrigerated for a maximum of 12 hours). 5) Serve cold on a bed of lettuce or in lettuce cups and garnish with peanuts if using them. If you roast a whole chicken or buy a rotisserie chicken for a meal, it’s extremely plausible that you are left contemplating about what to do with the leftovers. Leftover classic roast chicken is one of the most versatile ingredients that can be pieced into a multitude of recipes. Last week I was working on creating a recipe of a fall inspired whole roast chicken (recipe to follow in a few weeks) and found myself with plenty of leftovers. I decided that we would use the leftovers in a chicken salad the following night. The next day I found myself overcome by an urge to indulge in some Thai food and opted to give the leftover chicken a Thai twist. My favorite Thai salad is Yum Woon Sen Salad – a bean thread salad tossed with a tangy and spicy dressing and crunchy peanuts. The protein in the salad is typically shrimp and occasionally ground chicken or ground pork. I was confident that the cooked chicken would absorb all the wonderful flavors of the dressing and would make a great substitute for the shrimp. 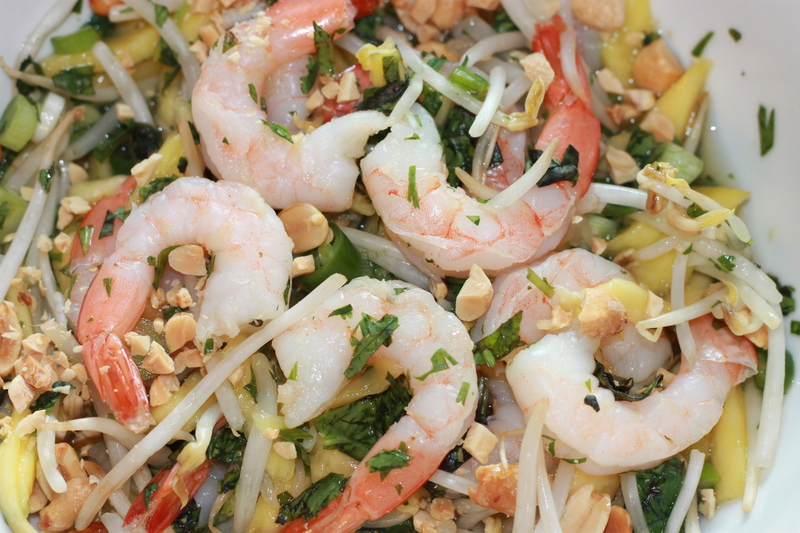 I used Rasa Malaysia’s Yum Woon Sen(Thai Noodle Salad with Shrimp) Recipe, but made several modifications as I wanted to work with ingredients in my pantry and fridge. This is usually a first course, but it makes a delectable and well-rounded one pot entrée for 2 people. 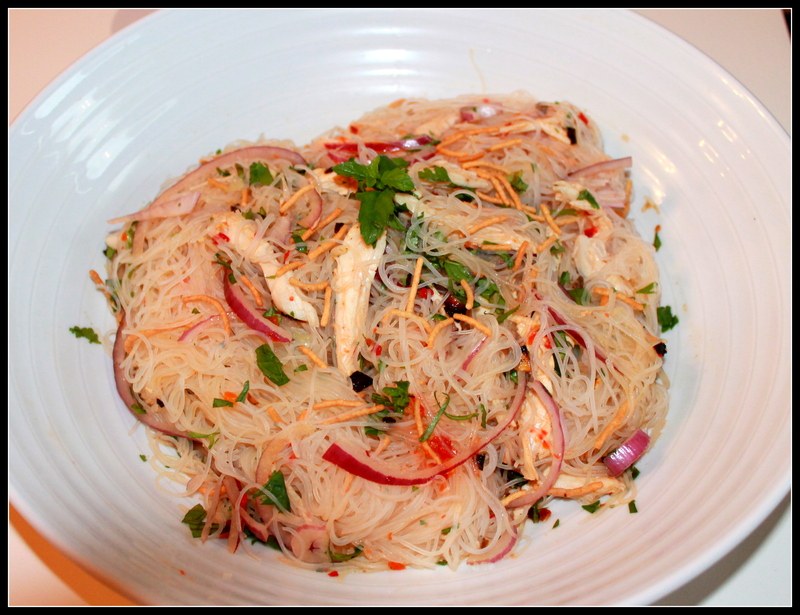 Traditionally a Yum Woon Sen salad is made with cellophane or bean thread noodles. Feel free to use those, if you have them on hand. If you do not like raw red onions, shallots are a great milder option. Traditionally this salad is topped with slightly crushed roasted peanuts. I had a box of La Choy Fried noodles, so decided to use those instead. You can use roasted peanuts or fried noodles. Chili Garlic Paste can be found in the international aisle of major grocery stores and in Asian markets. 1) Cook the noodles per the package instructions and set aside. 2) In a medium bowl, mix together all the dressing ingredients. Make sure that the sugar is completely dissolved. 3) Toss the shredded chicken in the dressing. 4) Place the cooked noodles in the bowl that you are going to serve the salad. To this add the onions, tomatoes, mint, cilantro, fried garlic, dressing and chicken. 5) Toss everything together to blend well. Taste and adjust the lime juice, chili garlic sauce or fish sauce as needed. 6) Top with the crunch of your choice (fried noodles or peanuts) and serve immediately at room temperature.